I have been so busy lately, I haven’t had a chance to add to my Baking 101 series, I apologize. I decided that since it was Chocolate Week here, it would be fun to share a short video with you about what else…CHOCOLATE! And of course, Cookie Dough Truffles too! I first made these little gems at Christmas time this year, and again to take to the New Years Eve Party we attended. Each time I make them, they are gobbled up quickly! Homemade Cookie Dough Truffles are a fun gift to make and give... recipe at HoosierHomemade.com. Using a cookie dough scoop, drop dough onto waxed paper and place in fridge for about 1 hour. Place back into fridge for about 1 hour. Melt Chocolate, dip balls, coating evenly. Drizzle with melted Pink or Red Chocolate and add sprinkles if desired. Are you baking for Valentine’s Day? Share with us what you are planning! I realize this was posted awhile ago, but I’m hoping you can tell me how many truffles does this recipe yield? I’m making them for a party this week and want to make sure I make enough. Thanks! Hi Missy, Depending on the size of the truffle, I would say at least 30 truffles. Let me know if you have more questions. Happy Baking! Thanks so much. I can’t wait to make them! Wow I loved this video. First of all you come across as super sweet! Second of all, when I made oreo truffles I had the WORST time dipping them in chocolate… it was a mess! I stuck a toothpick in my truffle then dipped in the chocolate but they kept getting stuck in the chocolate and falling apart. I think this method would work really well. And thanks for the tip on decorating with the wilton chocolates by just drizzling with a knife. I pinned this tutorial! Definitely going to use it. Do these need to be refrigerated after finished? They look so good!! I would keep them in the fridge until the day you are going to serve them. Because of the chocolate melting. There are no ingredients in the cookie dough that require refrigeration. Depending on how you want to serve them, cold or room temp, is how long you can leave them out of the fridge. I was just wondering if you can use this as a filling to a cake? My son wants a chocolate chip cookie filling and I can’t seem to find one. Yes, I filled cupcakes here… https://hoosierhomemade.com/cookie-dough-cupcakes-cupcake-tuesday/ You just need to bake the cake first, then use it to fill. You wouldn’t want to use this recipe to bake with. Made these for my family and co-workers for valentine’s day… they were a big hit with everyone! Thanks so much for posting! 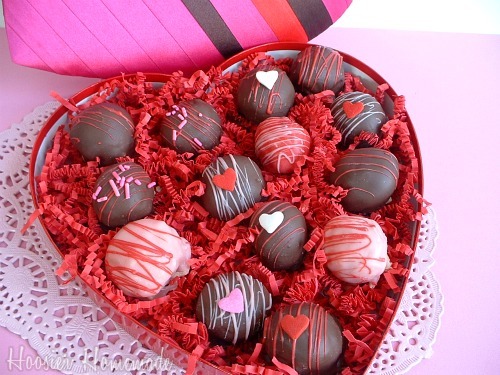 I am going to make these today for a Valentine’s party. I can’t wait to try them! Thanks so much for the good ideas! I’ve made similar truffles and they are SO good. Love that you used pink and red for Valentines day. I hope you stop by today, I have a linky up that would be perfect for this recipe. Thanks for reminding me. I popped in last night and the party wasn’t posted yet. I got busy and forgot this morning! These look wonderful and I love that there are no eggs in the cookie dough! I’m one of those psycho moms who won’t let her kids eat cookie dough. These will be popular at our house for sure! And btw, my husband’s a hoosier : ). Hi Liz, I live in LaPorte too! I work at the LP License Branch, so if you’re ever in there, please say hello. And if you ever need a taste taster or assistant, you know where to find me -LOL! BTW, I love your blog! Great job! How cool! I don’t think I’ve ever had someone from LaPorte leave a comment 🙂 Thanks for visiting! Great video Liz, I feel like I just had a short visit with a friend! Thanks so much Diane! I wish you were close enough to be here with me!! So you don’t have to cook these, even with the dairy items in it? No, you don’t cook them. There are no eggs, the sweetened condensed milk replaces the eggs.